It's time to get out of dodge for a few days. Everything is caught up, all the commitments have been met, and the magazine is being printed, so finally I can go away for a few days of fun and relaxation. It feels like it has been forever, and it has been about a year. Look out ocean, here I come. But before I go, I thought it would be nice to wander around outside and record a bit more of what is blooming and fruiting so that nothing is missed. First is this really lovely bee balm. It is about 3 years old, but was planted in a spot that was too shady. I moved it to a sunnier spot this summer, and it is rewarding me with lots of brilliant pink blossoms. Rudy found one of the few shady places to rest for a few minutes. This is one hard working farm dog. No matter what his master is up to, he feels the need to be in the middle of it. Bob must have been working inside the barn. Had a piece of equipment been started, Rudy would be on his feet giving the machine "what for" in an instant. That is his job. In case you can't tell from the picture, this is one of the sweetest dogs in the world. My brother is afraid of him. Hahahaha. Out front the purple vitex is beginning to bloom. Each of those bell-shaped maroon cups will eventually be a vitex berry. Last year, this bush was simply stunning, but this year it is blooming a little bit at a time and the color never really showed up. It is such a great violet. I've seen pictures of Jacaranda (sp?) trees in Australia, and they have that same vivid blue/purple color. This is the white vitex bush out back. It has a bit of a pink tinge and is much more prolific than the purple. Also, the berries are more fragrant. So there are more berries, and they smell stronger. That old bumble bee sure seems to like it. I've noticed this season that instead of little honey bees, we are inundated with bumble bees. Down on the hillside, I found a nice patch of wild yarrow. I would love to see it expand enough so that next year I could distill it. Black eyed Susans and yellow coneflowers.... They are having a riot on the hill. Many different varieties and many different shades and sizes. Don't they look happy? The oregano is going crazy. So far, I've chopped it back 3 times and it just wants to bloom. The butterflies seem to want it to bloom too, so I suppose it's time to allow it. We don't use a whole lot of oregano anyway, and it is so pretty... Maybe just a few sprigs to dry, and then I'll let it alone. Calendula - Herb of the Year. There are a couple of volunteer patches out front. In the one garden they are singles of yellow and orange. In the other garden, they are double yellows. They are cut back frequently and dead-headed to encourage more flowers. This is one of the new varieties of echinacea that I got from Possum Creek Herb Farm this spring. The petals are darker than they appear in this picture, almost as dark as the cone looks here. They make a nice contrast to the angustifolia in the back of the garden. Purpurea grows down at my sister's, and we should probably get some Pallida. We saw some green tinted echinacea growing in a garden the other day. It looked pretty cool! And finally, the elderberries are beginning to form on the bushes out back. The umbels are HUGE! Some are nearly 18 inches in diameter. The bushes are loaded. This is good news because last year wasn't a good year for elderberries. Even if the birds fight me for them - which is a certainty - there will be enough for everyone. So that's it for now. Off I go for a long-awaited attitude adjustment. Certainly those who live with or near me will be relieved. Since yesterday was all words, today will be mostly pictures. The lilies and daylilies are scrumptious this year. Some red monarda growing next to bronze fennel. 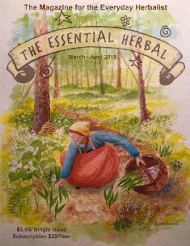 We have the magazine finished and ready to go to the printer, and we are caught up with other orders and such that piled up while we were away. Just need to use today for a delivery day, and we're good. I'm saving most of the pictures for a magazine article, so this will be a phot0-less post. One of the things that struck me over the 4 days of tearing wildly from one event to the next was how a circle of friends just keeps growing. Mike Eppley of singinghillemu.com asked us to do the soapmaking at the conference he organized. For a few years, he was "the emu guy" across from us at Landis Valley Herb Fair, and then the year we set up and did classes at the PA Farm Show, he was there too. He wanted us to do the classes because he thinks we're entertaining. We get a big kick out of that. We were amazed at the caliber of show Mike put together. Next was the Mid-Atlantic Lights & Lather Artisans conference. I don't really remember how Abbie from Scents & Sensibility and I started talking (or emailing, I should say), but the next thing we knew, Maryanne and I were scheduled to take part in the demos/talks. Cheryl from Erinn's Laine Candles was Abbies co-organizer, and they did a fine job! It felt like we knew everyone there by the time we went to sleep on Friday night, so the conference itself was a blast. And the prizes.... well, lets just say there were many, many prizes. We wound up winning a large gift certificate to Snow Drift Farms for having the most unusual (or something like that) soap. It was our road apples soap. I also won a gift subscription for a magazine! Scores of oils and scents to try out, and some coupons and offers that we have to look through carefully to be sure we don't miss out on the opportunities. Anyhow, Abbie, Cheryl, and Lyshel from Candle Cocoon seemed like old friends by the end of the day. Bonnie Barkley taught us all how to do gemstone soaps - and she is a funny lady. The woman who did molds... I'll have to find my program and put her name in... she was hilarious. Bambi from All About Travel might have sold a cruise too. Just need to get the biz out of the August doldrums. Last was the Int'l Herb Association Convention on Sunday. Sweet Sue Hess had offered to share a room with us, and it was heaven to have that all ready when we rolled into town after 10 Sat. night. We threw our table up on Sunday morning (the convention had started the day before), and I whoooshed out to do my presentation along with Stacy Fox, Francesco DiBaggio, and Susanna Reppert. Tina Marie Wilcox and Susan Belsinger were very welcoming. The local organizers were the Wadjas from Willow Pond near Gettysburg. It was a very nicely put together conference, and I really enjoyed the presentations I got to sit in on. More than anything though, any conference or convention where you are around people in your field (or like some this weekend - close), you meet people. You get to know them in a way that the internet doesn't allow. Now I will be able to picture the way people smile, or the tone of their voices when we write back and forth. It helps to form good solid relationships. It was a rough weekend, but so worth it. We came out of it enriched with new friends and acquaintances. On Saturday, Maryanne and I both have talks to give at the Mid-Atlantic Meeting of Lights and Lather Artisans in Pittsburgh. 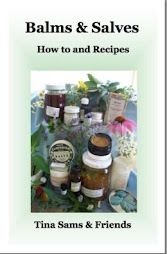 She'll be discussing soap colorants, and I am taking the still for a demo. Yesterday I was trying to decide what would be a good choice to distill. So I took off wandering around to see what options are available. The lavender is about kicked for now, so that's out. Next comes the rosemary. This plant is enormous for rosemary in MY growing experience. It grows next to a fir tree, and is cracking me up as it appears to be trying to compete for size. That could be my imagination. I've been known to assign motives to inanimate objects before, but it just seems to have an attitude. I distilled rosemary last year, and besides the bit of eo, the hydrosol has maintained every bit of its scent over the year. It might be a good choice. Rosemary soap is great, and the hydrosol could be used as the water. Balloon flowers aren't a good choice. To my knowledge, there's no reason to distill them. Still, this soft pink flower always catches my breath. I love the deep rays that stretch out from the center, the perfect symetry, and the way the buds turn into perfect hot-air balloons. When the guys in the family were piloting balloons, we found these flowers. The deep blue is stunning too. I just chose the pink because it is so delicate. The front garden. Nothing of interest here YET. The vitex was very interesting 2 years ago, and it made a lovely hydrosol. This year I would also like to try distilling echinacea to see what comes of it. It's the experimentation that appeals to me more than anything. Ah...meadow tea. I think this is spearmint. It reminds me so much of my childhood, when we'd set out for the day to play down by the creek. The boys would fish from a small plastic boat while I just tryed to stay as far as possible from A) fish hooks and B) stinging nettle. The scent of this mint is blended with the scent of fish living in a creek, to form one fresh, wild scent. A few years back I met a land management guy who, as we walked around a spring-fed pond, talked about being able to smell fish in a pond before even knowing there was a pond over the next hill or beyond the tree line. I knew exactly what he meant. It isn't a fishy smell. It's a smell of pollywogs and mud and grasses, mints and burn hazel and water. But this mint brings that smell to mind every time. I was glad to have someone point out to me that there even is such a thing as that. This would make a delicious distillate. It could be used in all kinds of ways, not the least of which would be culinary. Now this is the mountain mint that came home with me from Baton Rouge in ...was it last year? It has gotten huge and lush. The tops of the stems have all turned this luscious shade of pale green, while the lower leaves are brilliant jade green. This distills beautifully. 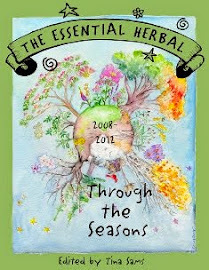 We did it for an herb guild last fall, and it was so strong as to make us almost woozy. The resulting hydrosol makes a spectacular body spray on hot days - especially if kept cold in the fridge. It also makes a wonderful minty soap. This would be the apple mint. There is so much out there right now I could fill the still 10 times and there would be enough left over to dry and have a few pounds. The plants are incredibly healthy, reaching halfway up the pines they grow amongst. The trees are about 7' tall. I distilled this mint last year, and it is a delicious, juicy mint. It is nice as it fills the room with refreshing mint while steaming away, producing essential oil and lots of hydrosol. Between my garden and my sister's garden, we'd probably have enough calendula to try. I've never done that one. It would probably be pretty sticky in the biomass flask, but that's simple enough to clean with a little alcohol. Perhaps we'll do this one later. If it works, I won't want to give it away, and it probably wouldn't be good to experiment in front of a group - if the experiment fails. I just like the blue of the chicory next to the blue spruces. It looks so pretty out in the field. Besides the chicory, there is a lot of Queen Anne's lace. The three together are stupendous. I'm pretty sure my bil doesn't feel the same, as the weeds aren't a good thing for him. Last shot for today is the elderflower slowly turning into elderberry. There are so many berries on the bushes this year that I just might try distilling them. That might be really cool. Or not. We'll see. So aside from that, I have peppermint, chocolate mint, and holy basil that could be distilled. It might just turn out to be whatever we're in the mood for on Friday when we pick it. There are just too many choices. Ok.. this is just annoying. Infuriating. In the early 90's, just as Nutrasweet gumballs were hitting mailboxes all over the United States, cargo ships loaded with Stevia were being banned from unloading in the united states. It seemed a very strange coincidence, particularly when a few years later the ban was lifted with no explanation ever given for the ban - or for the lifting of the ban. In fact, all during the ban, the US was encouraging South American countries to grow stevia as a cash crop in place of marijuana. We just wouldn't be buying any, thank you very much. The only thing was, when the ban was lifted, stevia was not approved as a food additive. Stevia, under the rules of the FDA, could have gotten Generally Recognized as Safe (GRAS) status as an existing product with a history of human consumption. Without FDA approval or GRAS status, stevia must be marketed under the less-regulated category of "dietary supplement". This is an import alert, updated just this year... Stevia is still considered to be suspect, and can be turned away from port or confiscated. have worked long and hard to make stevia available to the public, Goliath (in the guise of Coca-Cola and Cargill) comes along and "discovers" the benefits of this "new" sweetener. Where will this leave the family owned businesses that depend on stevia? In the dust. Somehow the big boys found a way to get around the problems that plague the small businesses. Oh sure, the new sweetener - Truvia - is about as far from stevia in its natural state as can be imagined. These colossal corporations have isolated the sweet component and do away with all that makes the sweetener natural. They will, of course, market it as natural. I've often felt very sorry for the people who spent the last several decades making organic, whole, pure foods available to the paltry few who were searching for them. We've had a couple of local families who've been in business for at least 40 years each, eeking out a living, called to provide "health foods". Then, just when things started to go their way and living got easier, WHOOSH!!! the rug is pulled out from under them as the big boys come and take their business. I know it's the way of business, but it makes me sick. Right now the herbs are all knocking themselves out, wanting to be a part of the daily cooking experience. A great way to have them handy is to hang them near your cooking area - not to dry, but to use! A twisted honeysuckle branch is used here, but there are many other options. 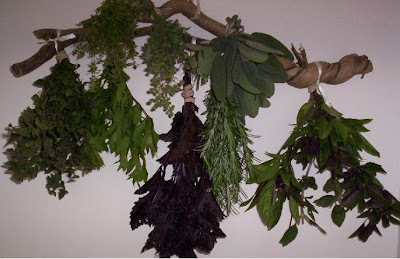 To dry herbs for use during the winter, gather the herbs mid-morning, when the dew has dried, but before the full noonday sun hasn't hit them and dissipated the essential oils from the leaves. Put the herbs in small bunches so that there is little chance of mold or spoilage, and fasten with a rubber band. A rubber band will shrink as the stems dry. If there are seeds or small petals that will fall off, place the herb into a paper bag to catch them. Hang upside down. For small flowers or petals - like chamomile, calendula, rose petals, etc., an old window screen works very well, especially if you can find a place where the screen will have air circulation from both the top and bottom; perhaps a couple of bricks can hold it off the floor. Keep it in a dim, dry area and when they are crispy dry, put them in a jar or bag, marked with the contents and the date. Do not crumble them, but leave them in the wholest form possible so that they'll stay fresher. No matter how you dry or preserve your herbs, be sure to keep them somewhere that is handy so you remember to use them throughout the winter when they will bring back the flavors of summer. Self Diagnosis, or Dr. Who? This has been stewing in my head for a while, but it probably will still come out wrong. Is it because healthcare has become so expensive that it is out of the reach of middle America, nevermind our poor? Is it because the internet has put so much information at our fingertips that we are deluded into thinking that we know more than we do? More and more, I am seeing perfectly intelligent people who are willing to risk their own health and the health of their loved ones while they play doctor. This scares the hell out of me. I am a proponent of herbal medicine. I want to see the use of herbs as medicine grow and become a part of the integrated, holistic healing practice of our medical model. There are many self-limiting illnesses that could be helped herbally, keeping people out of doctors offices. There are many herbal treatments that can help with various diseases and illnesses - after a proper diagnosis has been made. I've been around long enough to have seen several "miracle, cure-all, new, multi-level herbal remedies" come onto the market. Some of them died a natural death, and some of them went to court. The reason they even exist is because there are so many people who are willing to believe that such a thing is possible. And that's scary. Scary that there are people who want to rip others off with no regard to the possibility of killing them because they don't get decent care, and scary that there are people who take things on their own without doing any research, blindly accepting the hype. There is something even scarier happening now, in my opinion. In the past several years there seem to be more and more people who are not bothering to find out what is wrong before they start treating themselves or their families. They do self-diagnosis, and self-medication. Strangers I've never set eyes on will write with questions on serious life-threatening illnesses, as if it is just fine to write to a random stranger for something that could alter or end their lives. Many of my herb friends have the same experiences. This is crazy! 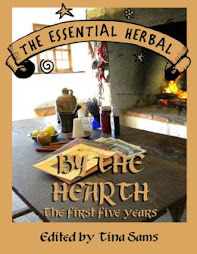 10 years ago, when we had our shop, we often had customers who came in for herbs AFTER seeing a doctor, getting a diagnosis, and doing some research into their condition. They made INFORMED decisions, based on all of those factors. Others came in and asked us to diagnose them. We wouldn't do it. We aren't doctors, and we suggested that they see one. 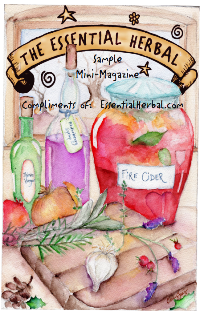 So please folks, I implore you... Use herbs for first aid, for staying comfortable during a self-limiting illness, and to improve your health and immunity. But if you have a serious problem, or one that doesn't resolve with the use of herbs in a reasonable amount of time, see a doctor. Using herbs irresponsibly is bad for everyone. It hurts the one using them, and it hurts the industry as a whole, possibly threatening the future use of herbs for all of us.